On our Raleigh, N.C., visit we stopped at as many museums as possible. All free (except special exhibits). My favorite pieces in the museum were photographs by Alex Soth, paintings and photographs by Page H. Laughlin and Pamela Pecchio and “Three Graces,” by Mickalene Thomas. The museum houses a wide range of pieces, from Ancient Egypt to Contemporary American. Definitely an art museum to check out. This museum also has outdoor trails (from 1 mile to just over 2 miles in length) that wind through an open field and woods, showcasing various art pieces. We did not get to spend much time in this museum, but enjoyed the few exhibits we did see. We started at the exploration and settlement of the New World by European colonists and made most of our way to the Civil Rights movement before needing to head back home. Besides dates and facts one usually relates with history, the museum also offered a look into the cultural aspects of the various time periods — from agriculture and tools, to education and music. I wish we could have spent more time reading each sign and listening to recordings. Note: Lots of school groups visit the museum. So expect to share the space with youngins. This museum seems to appeal to kids and adults alike, which I like. There’s nothing worse to go into a museum looking to learn things but all the exhibits are dumbed down for grade school students. It makes you think you’re out of place. This museum seemed to have a nice balance of nice educational aspects for adults and then some interactive activities for kids. It strikes a good balance, which, I think, is hard to do. There were lots of student running around. Literally. And it was very loud. So, be prepared during the school day to share the visit with lots of students from grade school up to middle school. Most of the teachers, and a few of the chaperons, tried to make sure their kids were behaving, not cutting in front of people and not running. But in many cases, there wasn’t much control over the kids. Still the museum is worth the trip, though you may need to move more quickly than you’d like to get out of the way of large groups. So, if you’re in the Raleigh area, check out these state jewels. They are worth the gas and time to get there. Categories: Small Travels and Musings | Tags: exhibits, museums, north carolina, North Carolina Museum of Art, North Carolina Museum of History, North Carolina Museum of Natural Sciences, Raleigh, trips | Permalink. 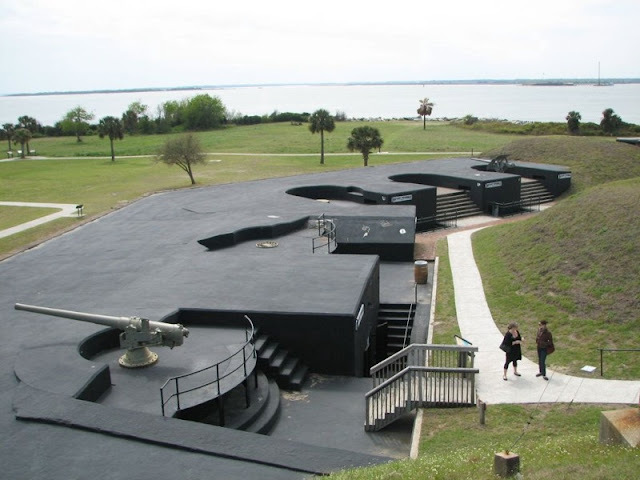 Fort Moultrie is part of the National Park Service and is an amazing relic of our history. 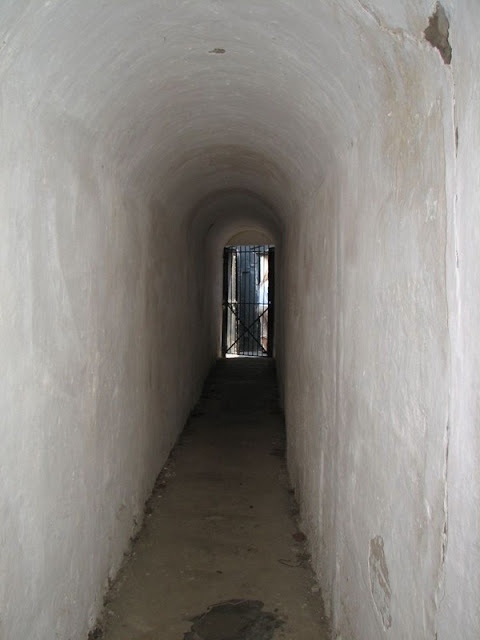 I loved walking around the fort, imagining what it must have been like to work as a soldier there during the years. 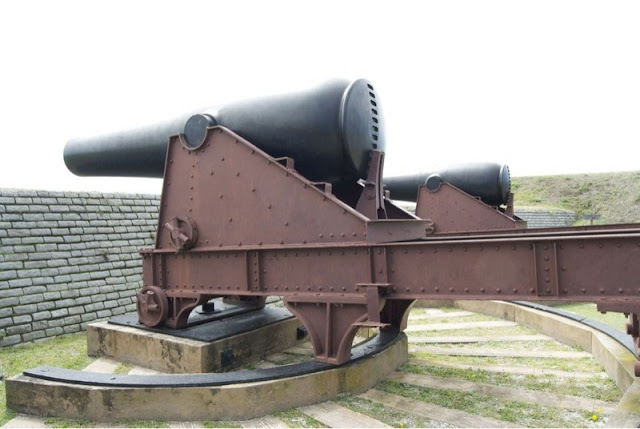 The current fort was built in the 1800s. 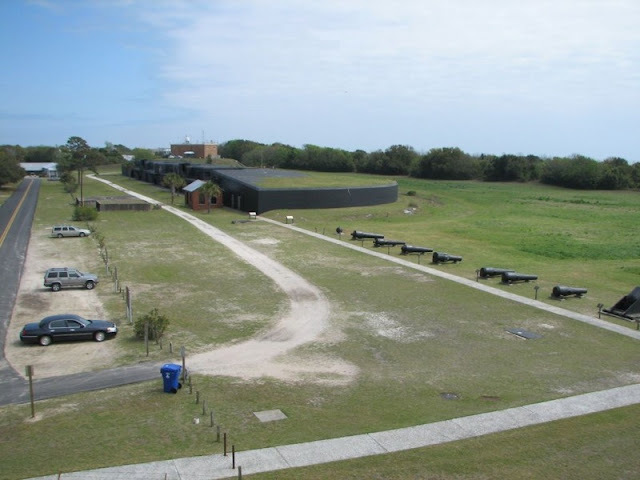 Two other forts sat on the same site prior to the current structure. 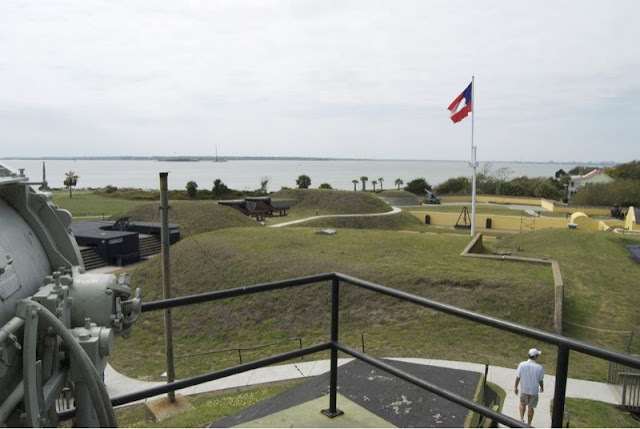 Interpretive signs point to the former fort locations and tell when they were built, how they were made and how they served us during that part of our history. The site’s history spans from a log fort built in 1776 to WWII. I’m not big on military-related historic sites, but this is definitely a must see. 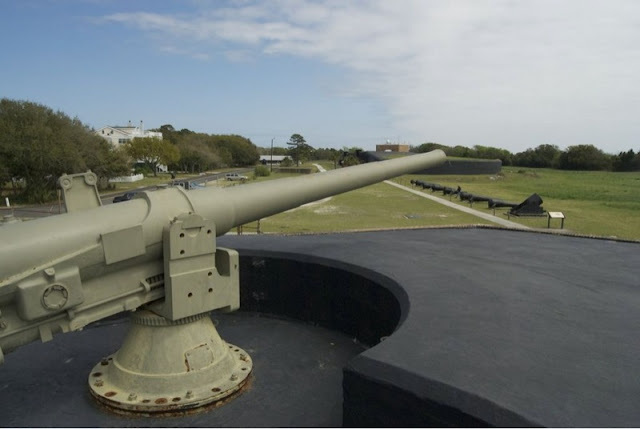 Categories: Small Travels and Musings | Tags: Fort Moultrie, historic sites, history, museums, national parks, South Carolina, trips, vacations | Permalink. 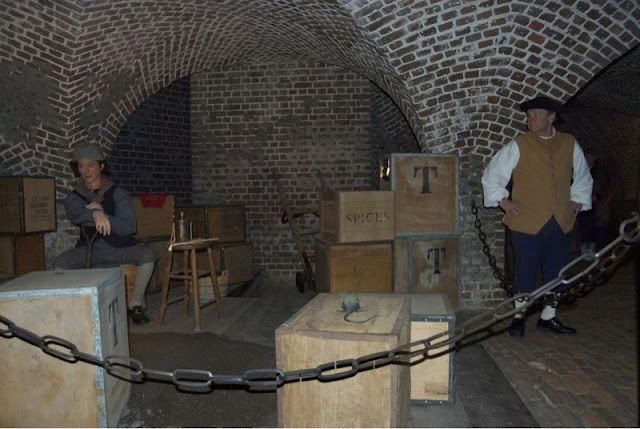 Exchange and Provost, Charleston, S.C.
Our last stop on Charleston’s Museum Mile was the Exchange and Provost Dungeon. To the right is our tour guide. An animontronic figurine is to the left. The tour provides a lot of historic info about the city, pirates, George Washington’s visit and the city’s part in the American Revolution. Down in the dungeon, you’ll find animontronic figurines that’ll tell stories about the prison and building. On the way to Charleston, we met a couple who used to volunteer as pirates and other characters at the Exchange. Now that the museum uses mechanical storytellers, there’s no need for real people, except for the lone tour guide. 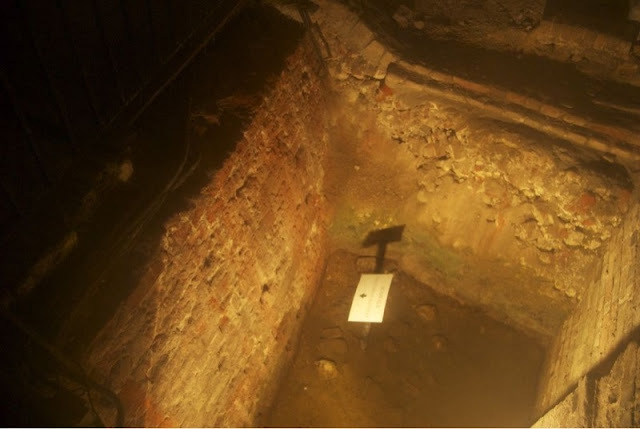 This is a well with water and fake rats located in the dungeon. It’s supposed to show the horrid conditions prisoners had to stay in. I think that is unfortunate because it would be neat to talk with various people about the building and its history. 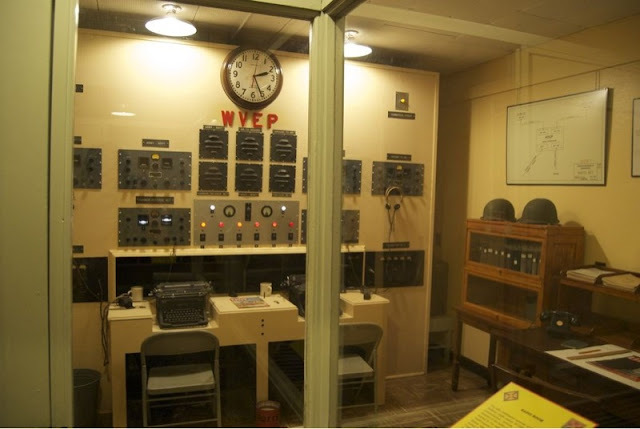 I’m sure providing more than one volunteer would offer a greater depth of knowledge about the building than one tour guide and prerecorded machines could provide (though our guide was very knowledgeable). Still, this is a good stop along the Museum Mile. Categories: Small Travels and Musings | Tags: Charleston, Exchange and Provost Dungeion, historic sites, history, Museum Mile, museums, South Carolina, tours, trips, vacations | Permalink. Nathaniel Russell House, Charleston, S.C. The Nathaniel Russell House was the second stop on our tour down Charleston’s Museum Mile. This is another merchant’s town home and is built in the Federalist style. We visited this home with combined admission to the Aiken-Rhett Home (see prior post). Of course, like the Aiken-Rhett House, we were not allowed to take any photos inside. Though it was raining, we did get a couple photos of the gorgeous gardens behind the home. It would not stop raining! Another good stop along the Museum Mile. Categories: Small Travels and Musings | Tags: Charleston, historic sites, history, Museum Mile, museums, Nathaniel Russell Home, South Carolina, tours | Permalink.